Patented technology and innovative design are found in Global Ocean Design’s line of benthic landers, range-and-bearing-to-target locating beacons, moisture removing vacuum purge systems, pressure-activated switches, polystyrene instrument spheres, burnwire release devices and more. 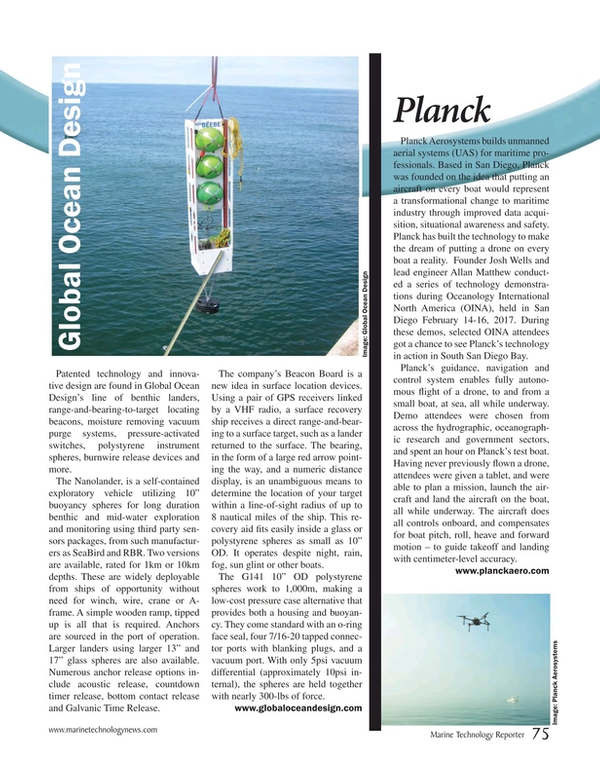 The Nanolander, is a self-contained exploratory vehicle utilizing 10” buoyancy spheres for long duration benthic and mid-water exploration and monitoring using third party sensors packages, from such manufacturers as SeaBird and RBR. Two versions are available, rated for 1km or 10km depths. These are widely deployable from ships of opportunity without need for winch, wire, crane or A-frame. A simple wooden ramp, tipped up is all that is required. Anchors are sourced in the port of operation. Larger landers using larger 13” and 17” glass spheres are also available. Numerous anchor release options include acoustic release, countdown timer release, bottom contact release and Galvanic Time Release. The company’s Beacon Board is a new idea in surface location devices. Using a pair of GPS receivers linked by a VHF radio, a surface recovery ship receives a direct range-and-bearing to a surface target, such as a lander returned to the surface. The bearing, in the form of a large red arrow pointing the way, and a numeric distance display, is an unambiguous means to determine the location of your target within a line-of-sight radius of up to 8 nautical miles of the ship. This recovery aid fits easily inside a glass or polystyrene spheres as small as 10” OD. It operates despite night, rain, fog, sun glint or other boats. The G141 10” OD polystyrene spheres work to 1,000m, making a low-cost pressure case alternative that provides both a housing and buoyancy. They come standard with an o-ring face seal, four 7/16-20 tapped connector ports with blanking plugs, and a vacuum port. With only 5psi vacuum differential (approximately 10psi internal), the spheres are held together with nearly 300-lbs of force.